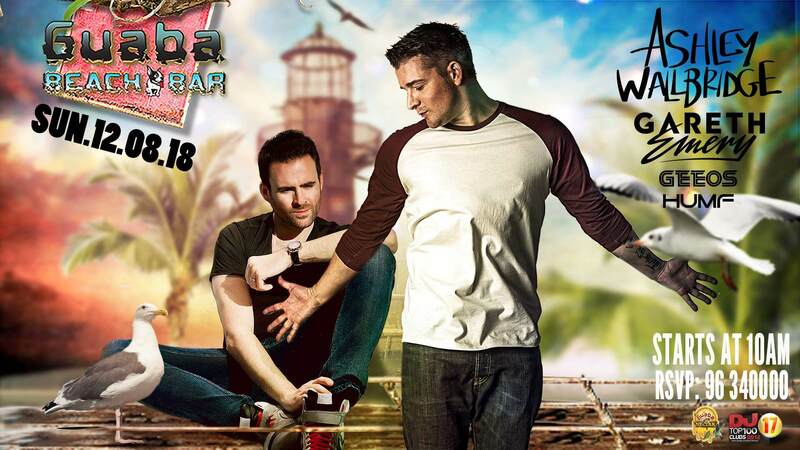 2 Brit boys, well known in the global trance & progressive house charts, Ashley Wallbridge & Gareth Emery return home to Guaba Beach Bar this summer! As you may know UK born Ashley is an English DJ, producer, and remixer hailing from Stoke-on-Trent. He is best known for his unique sound and his big room tracks. His debut album, "The Inner Me" was released on 9 March 2012 on Armada Music, and has dominated world-wide venues & festivals year after year. Gareth Emery, also UK born, is best known for his three artist albums: Northern Lights, Drive and 100 Reasons To Live and winning the prestigious A State Of Trance Tune Of The Year award three times. Gareth Emery is one of dance music’s most influential and innovative DJ producers, voted no.7 in DJ Mag’s ‘Top 100 DJs’ poll making him the UK’s highest ranked DJ, and one of the youngest DJs ever to crack the top ten. Two huge names in one big venue... don't miss this special Sunday! Or Private Message us and we will assist you with all your queries.